Wednesday, May 1, 2019, 7:30 at the Senior Center. All are invited. 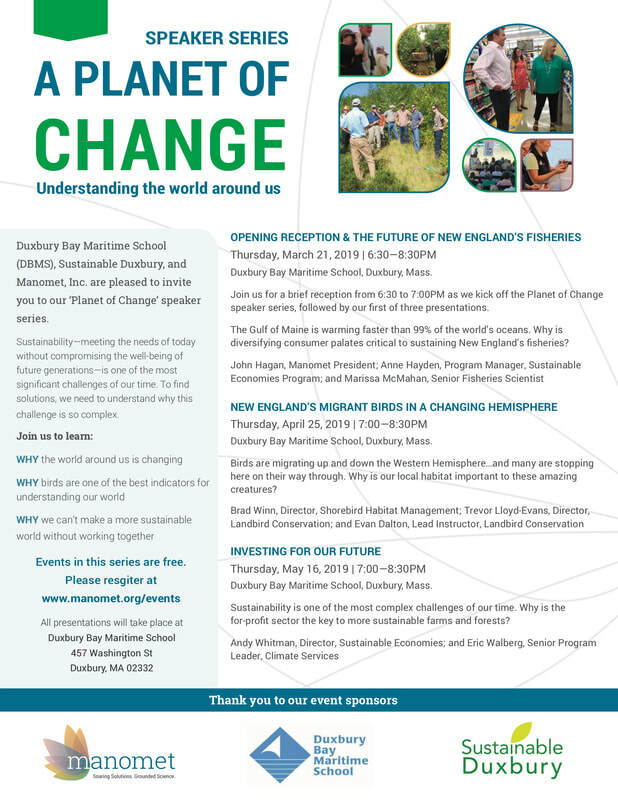 Duxbury Bay Maritime School (DBMS) and Sustainable Duxbury have joined Manomet, Inc. to host A Planet of Change: Understanding the World Around Us, a three-part speaker series taking place this spring. Each presentation features Manomet’s scientists, who will address some of the major environmental, social, and economic challenges New Englanders face in 2019, solutions on how to deal with these challenges, and what the future looks like for our planet. Our next event is: New England’s Migrant Birds in a Changing Hemisphere | Thursday, April 25, 7:00—8:30 PM. To learn more and register, visit https://www.manomet.org/events. All presentations will take place at the Duxbury Bay Maritime School, 457 Washington Street, Duxbury, Mass. New England’s Migrant Birds in a Changing Hemisphere | Thursday, April 25, 7:00—8:30 PM. Investing for our Future | Thursday, May 16, 7:00—8:30 PM. Straws, the Movie, was shown Thursday, January 17. Thanks to all for coming and get out there and refuse straws! 2019 will be the third year awarding this prize to a young person who demonstrates a passion for the environment. We are planning our next award by reviewing the past, making changes, and setting a schedule. Further discussions will continue how we might be able to have residents recycling their food wasted into a town wide composting area. We have talked to the Selectmen and will continue discussion about how we can better educate everyone about the practice of car idling and the problem with it. There are several ideas on the table including the endangerment of the Right Whale. How do we get them back around town. As it closes for the season we will review how it went and how we move forward to next year. On May 2, 2018, 4 members of Sustainable Duxbury were honored for their volunteering efforts. Paul Mabey (left) nominated Susan Fontaine, Jim Savicki, Janis Owens and Mike Wilson for this award. From recycling to minimizing pollution to education, Janis, Susan, Mike, and Jim have made significant headway in Duxbury's role in going green. On Monday evening, April 23, 2018 two Chandler Elementary School students received the 2018 Duxbury Environmental Leadership Award in a ceremony at the Duxbury Free Library. The award was given to Henry Waitkus, age 7, for his commitment to saving the endangered North Atlantic right whale and to Eleanor “Nora” Wien, age 8, for her commitment to improving the local environment with a tree-planting project following the recent devastating storms in Duxbury. A $100 cash prize will be awarded to support their initiatives. Henry designed and has been selling wristbands to raise money for the protection of right whales. His fundraising efforts to family, friends, and local businesses have raised about $350 to date. He plans to donate the money to the Center for Coastal Studies in Provincetown, MA. After a meeting with Dr. Charles “Stormy” Mayo, PhD, senior scientist at the Center for Coastal Studies in Provincetown, MA, and director of the Right Whale Ecology Program, Henry set his sights on raising $1,000 to donate to the center’s Right Whale Ecology Wish List to purchase equipment for monitoring and protecting the marine animals. The award has coincided with the arrival of migrating right whales right off our coast. For her part, Eleanor “Nora” Wien said she decided to help “my town environment,” planting trees lost during the winter storms. She has reached out to the Town’s Tree Warden. She also talked to a Pembroke tree farmer who told her that evergreen saplings would be a good, inexpensive choice. She plans to buy the saplings and resell them in town. Her brother, Henry, a Boy Scout with Troop 62, has volunteered with his troop to help distribute and plant the saplings for Duxbury residents. The Duxbury Environmental Leadership Award celebrates the ideas and actions of young environmentalists who demonstrate initiative, leadership, and a desire to improve the local and global environment. Possible award categories include recycling and composting; the protection of endangered species; climate change and sea level rise; energy or water conservation; and renewable energy. Last year’s award recipient, Garnett Seagall, worked with the town to post a turtle crossing sign near Chandler Street after noticing not all of the turtles made it to safety when crossing the road.She is currently working on a project that involves chocolate in the shape of turtles. 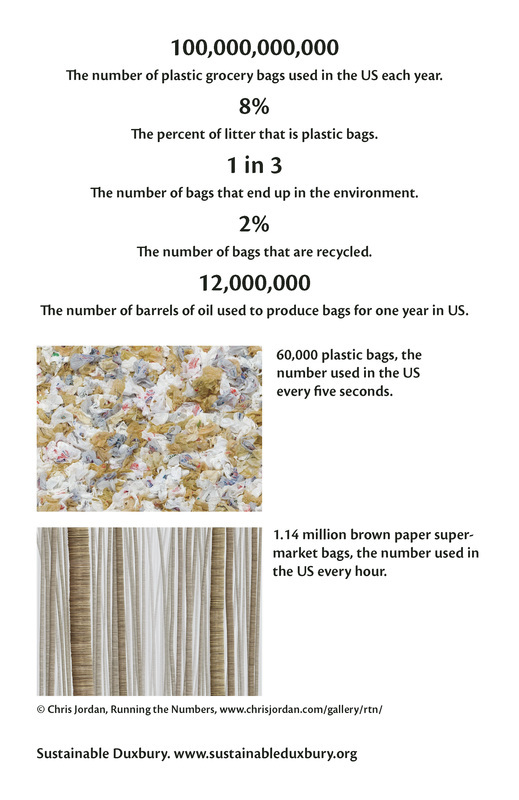 Sustainable Duxbury’s mission is to encourage people in town and the group’s own membership to become more sustainable by informing the community about ways to recycle, save energy, and improve the local environment. The showing of this documentary at the Duxbury Bay Maritime School was a great success. Several people asked how they can view this film again or share it with others. It is available on Netflix as a DVD. You can also purchase your own DVD. Go to their website, plasticocean.org, where you will find more information. 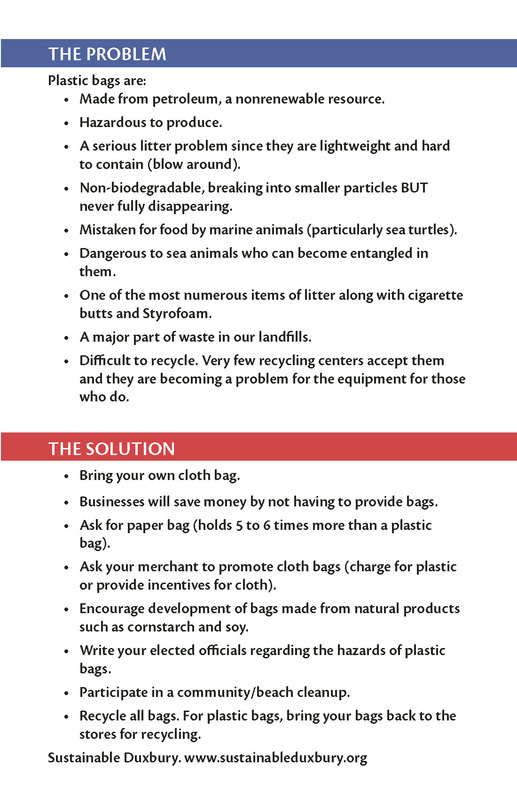 There is also a lot of information about plastic pollution and what we can do. We are sponsoring a showing of the shorter version of this film to the Duxbury schools. 2. Put a Price on Carbon (S.1821: An Act combating climate change; H.1726: An act to promote green infrastructure, reduce greenhouse gas emissions, and create jobs. Go to 350mass for more information. You can support by emailing your state representative and senator or by meeting them in person at one of their local meet ups. 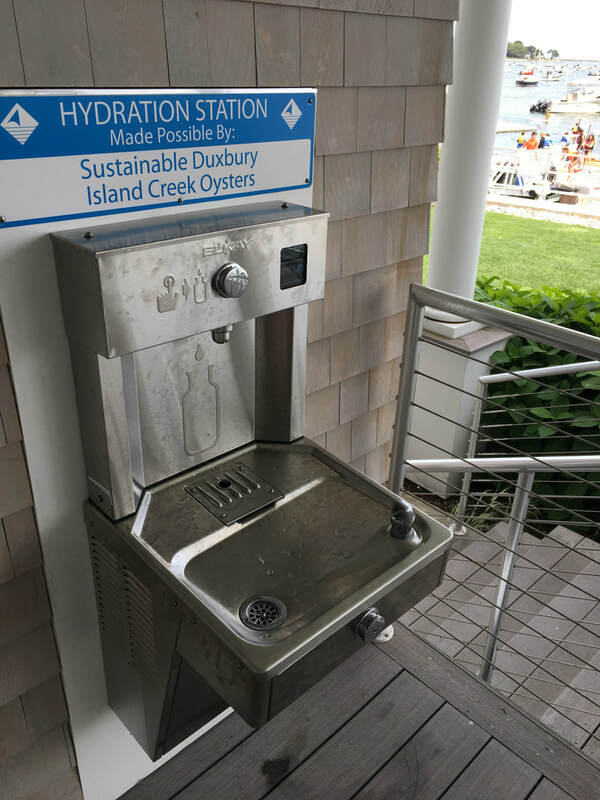 Sustainable Duxbury and Island Creek Oysters teamed up for the new H2O station at Duxbury Bay Maritime School! DBMS will be a greener campus by helping everyone to bring their own reusable water bottle. DBMS bottles are available for $5. Sustainable Duxbury is helping out the Duxbury Interfaith Council's TLC program by donating 50 of our Sustainable Duxbury reusable cloth bags. The bags will be used to for packing school supplies that are donated to students who need the help. "The TLC program - Teach our children, Learn to give, Care about others - started with a seemingly simple, generous act by one boy. To celebrate his 10th birthday, this giving child accepted school supplies in lieu of gifts. All the school supplies were donated to a few families in need through the Duxbury Interfaith Council’s Outreach Services. The success of this heartfelt deed encouraged a group of four children to take it a step further. That’s when they came up with the TLC backpack project." We Let the Sun Shine Again! Town Meeting voted to approve Article 15! This is a step to help cut down on plastic in our environment. Watch on Demand on the Nat Geo channel. Check it out here. The show not only presents the problems but also focuses on the solutions. Elaine Philbrick gave a presentation about her company of 3 years using goats for landscaping purposes. Out west in Washington and California goatscaping has been a big business for many years, employing some 400 goats that live with goat wranglers, cleaning up highways and other large areas. Her company can do very small jobs, as small as 1/8 acre areas. She has 12 herds of 4 goats each. They rent by the week for $750/week. They already have 225 rental weeks with 150 customers over 70 towns. Information can be found on www.gogreengoat.com. PAC TV has prepared a wonderful presentation on our beautiful Community Garden. Mike Wilson and Jim Savicki are interviewed and give an overview of how the garden started and what is happening this summer. Take a look and listen by clicking here. 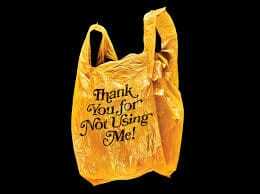 We parternered with Hannaford's and Stop&Shop in Kingston to help cut down on the use of plastic bags. We setup at Hannaford's from 10 to 12 and at Stop&Shop from 12 to 2 and gave out several hundred FREE BAGS. The 68th UN General Assembly declared 2015 the International Year of Soils (IYS). In this spirit we will be presenting 2 films and one panel discussion to discuss the importance and fascination of the soil, the dirt we walk on and eat from. "There’s a glowing appreciation for the rarity and value of truly fertile soil"
Thursday, March 19, 2015: We showed DIRT! The Movie in the Merry Room of the Duxbury Free Library. This important film is narrated by Jaime Lee Curtis and brings to life the environmental, economic, social and political impact that the soil has. It shares the stories of experts from all over the world who study and are able to harness the beauty and power of a respectful and mutually beneficial relationship with soil. The film shows how dirt has given us food, shelter, fuel, medicine, ceramics, flowers, cosmetics and color--everything needed for our survival. For most of the last ten thousand years we humans understood our intimate bond with dirt and the rest of nature. We took care of the soils that took care of us. But, over time, we lost that connection. We turned dirt into something "dirty." A millennial shift in consciousness about the environment offers a beacon of hope - and practical solutions. Thursday, February 26, 2015: We presented a panel discussion with experts to talk all things dirt including how to save time, money and the planet through wise lawn care practices. Click here to see an excellent PACTV presentation about the program. Deb discussed landscaping practices (particularly irrigation and chemical use) that have less impact on the environment and the responsible management of water resources. Holly Hill Farm is an organic farm located 25 miles southeast of Boston in the beautiful coastal town of Cohasset and consists of 140 acres of land which includes 10 acres of open fields of which 3 acres are growing fields, historic buildings, greenhouses and diversified natural areas for educational purposes. Jon discussed creating organic soil and compost. Todd has owned and operated landscaping companies, worked in financial planning, and most recently started a company called The Grateful Garden, a sustainable garden supply and vegetable growers resource center with a focus on education. As Todd say, “I want to grow vegetable gardeners.” He discussed how to make good soil and grow great vegetables. 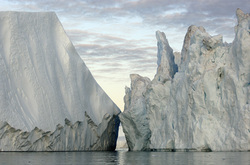 In the spring of 2005, National Geographic photographer James Balog headed to the Arctic on a tricky assignment: to capture images to help tell the story of the Earth’s changing climate. Even with a scientific upbringing, Balog had been a skeptic about climate change and a cynic about the nature of academic research. But that first trip north opened his eyes to the biggest story in human history and sparked a challenge within him that would put his career and his very well being at risk. After that first trip to Iceland, the photographer conceived the boldest expedition of his life: The Extreme Ice Survey (EIS). With a band of young adventurers in tow, Balog began deploying revolutionary time-lapse cameras across the brutal Arctic to capture a multi-year record of the world’s changing glaciers. Wanting to capture a very broad representation of glaciers all around the world, Balog and his team also shot footage in Greenland, Iceland, Glacier National Park in Montana, the Alps, Bolivia, Canada and more. He wanted EIS to show people visual evidence of how glaciers are responding everywhere—not just in one region. Duxbury Free Library now has this DVD available for distribution, a gift of Sustainable Duxbury. The library suggests that anyone interested in watching the movie, use the catalog and place a hold on it. That way you are assured of getting the title. From the catalog, the title search should be the entire title: Switch : discover the future of energy. The call number is 333.79 SWI DVD, and it is currently shelved with the new books. The library also has 2 Kill-a-Watt kits available now. They are on the main floor of the Library, near the new books, with a big sign that says "Makerspace." They are also in the catalog and holds can be placed on them. To find in the catalog, enter the term: "Makerspace" in the "search for" box and click on the "words or phrase" button. The Kill-A-Watt kit should be the third item in the results list. Duxbury Public Schools and Sustainable Duxbury have joined hands to clean up the schools’ playing fields. How? They are making it easy to recycle discarded cans and bottles. Next to each trash bin is a new recycling container for bottles and cans. and Recreation Director, Gordon Cushing distributed the letters to the coaches. 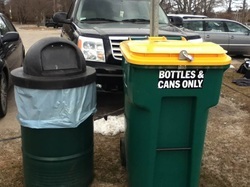 Sustainable Duxbury is working with the schools and DPW director, Peter Butkis and his staff on additional recycling containers, as well as educational initiatives to reduce litter, and increase recycling. 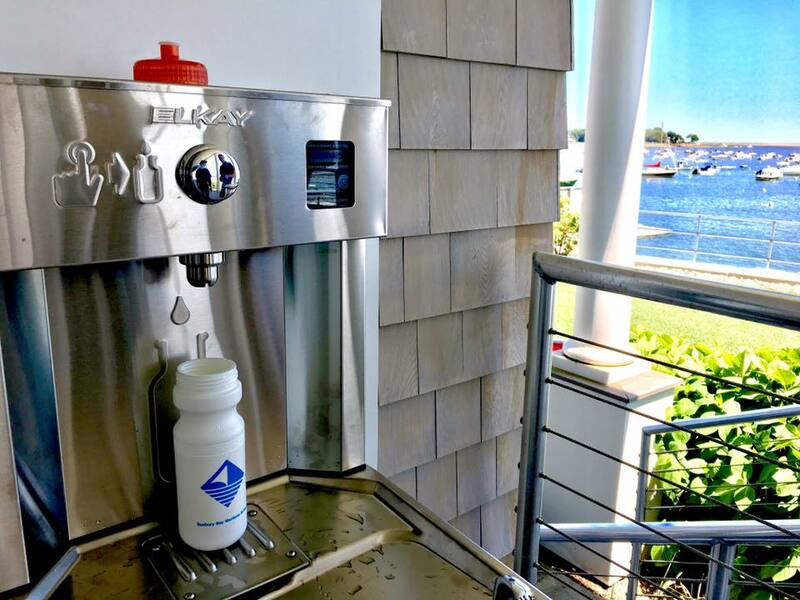 Steps to a cleaner and more sustainable Duxbury. Be on the look out for new recycling bins coming to Coppens Field at Chandler School in about 3 or 4 weeks. With everyone's help we can keep our fields free of trash. Please encourage everyone to pick up bottles and use our new bins! Another useful resource for composting is the Guide to Agricultural Composting published by the Massachusetts Department of Agricultural Resources. You can download this pdf here. For additional information go to: http://www.mass.gov/agr/divisions/ag_technical_assistance.htm.